Our educational experience for Hunter has definitely been a journey. We attended a traditional french immersion school from kindergarten until the end of Grade Three. Concerns about classroom size, social environment and actual learning brought about the shift in Grade Four to attend the first Montessori school in the Yukon, which provided a solid learning environment coupled with personal accountability. Grade Five was our first homeschool/roadschool experience as part of our 8 months of travel and was a big success. I have harboured a fascination about homeschooling and specifically unschooling for years. We used to live in the country and were surrounded by families that were doing this to some degree or another, while Hunter and I were busy driving the 30 minutes into town and back every day. There are many articles and arguments for how the philosophy of unschooling maximizes kids creativity and innovation by allowing them to follow their passion and curiosity. The article in this month’s Outside Magazine paints a great picture of what is possible and certainly got my mind spinning about our year this year. Based on our success last year and our ongoing desire for increased flexibility, we made the decision as a family to homeschool again this year. We are now fully hooked into the Yukon Home Educators Society and I am excited about what the year will bring with respect to the many co-curricular activities that we are working towards (introduction to trades, learning to code and build websites, environmental science & education, geography fair, year long first nations carving program etc.). This year will be a mix of road schooling, unschooling and distance education. We are enrolled in a BC based school called Youlearn and I’m hoping that it will be the best of all worlds. They enable and support road schooling and unschooling while also providing academic support and a report card that validates it all at the end of the year. Hunter and I had our first Skype call with the Principal yesterday and it left us both feeling excited for the year. We are building an independent learning program for the year that incorporates all of the travel adventures that we have planned and how those experience can be leveraged to achieve the curriculum outcomes needed. The science of extreme environments fits nicely into our trip to Ecuador and our 4 days in Ottawa in September will go a long ways for our social studies work. My goal is to achieve our outcomes through as much interactive learning as possible. Hunter is a minimalist so the fewer textbooks we have to deal with the better for everyone. He truly is a hands on experiential learner and we see this over and over again. Next week we are off to the Instructables night at Yuconstruct as step one in learning about electricity, which also happens to be a Grade 6 curriculum item. This year’s schooling is just one more adventure where I’m sure that we will learn a lot and adapt along the way! I love to read about Hunter’s learning experiences. It gives me hope the next generation will be lead by kids like Hunter who will have a broad view of the world and the creativity to make positive changes. Thanks! Thanks Kelly for the comment!. Thanks to you and Phil for being part of the community that helps Hunter learn. By engaging with kids as “people” vs “just kids” other adults can have such an amazing influence on them. 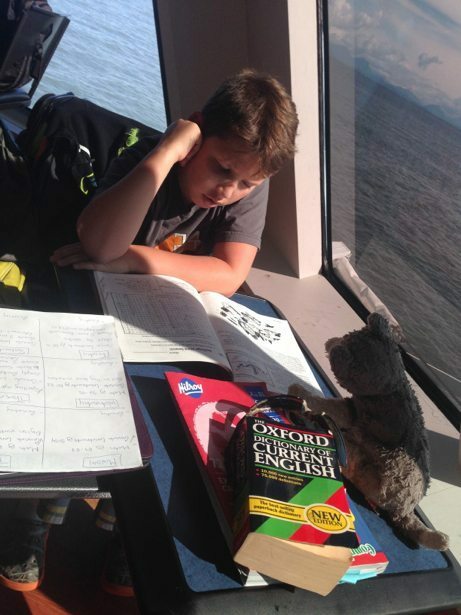 We’re looking to stay in the Yukon for a while but the homeschool rules and regulations have freaked me out. I have spoken to a government guy and he has said that the Yukon do not and will not support unschooling at all which is a major problem for us. Like you we have been travelling. We’ve just spent the last 16 months on the road starting in Nova Scotia going right across Canada to Vancouver, then north to the Yukon and Alaska – we’ve just come back from Inuvik which was amazing! Anyway I wondered if you could maybe give me some advice on the rules in the Yukon for homeschool and how you do unschooling when they have told me it’s not allowed?